NF-κB plays a central, proinflammatory role in chronic intestinal inflammation, yet recent work suggests a predominantly protective function for this transcription factor group in some cell types of the intestine. 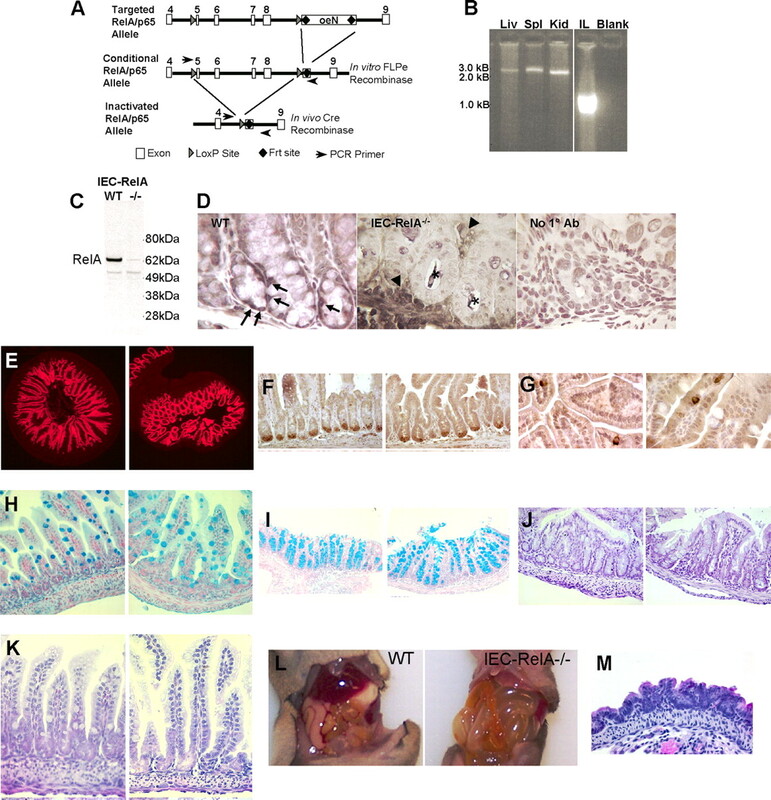 We herein describe the conditional deletion of the NF-κB RelA gene in murine intestinal epithelia and determine its function in homeostatic control of enterocyte proliferation/apoptosis and susceptibility to colonic inflammation. Mice lacking RelA in ileal and colonic enterocytes were born in expected Mendelian ratios, and RelA-null epithelia differentiated normally. Spontaneous intestinal disease and death occurred with low penetrance in neonates lacking epithelial RelA. IκBα and IκBβ were significantly diminished in RelA-null epithelia, and endotoxin challenge revealed elevated p50 and c-Rel DNA binding activity as compared with controls. Deletion of RelA resulted in diminished expression of antimicrobial (defensin-related cryptdin 4, defensin-related cryptdin 5, RegIIIγ) and antiapoptotic, prorestitution genes (Bcl-xL, RegIV, IL-11, IL-18), and basal rates of epithelial apoptosis and proliferation were elevated. Mice lacking colonic RelA were sensitive to dextran sodium sulfate-induced colitis. Although experimental colitis enhanced proliferation in cells lacking RelA, sustained epithelial cell apoptosis precluded mucosal healing and decreased animal survival. We conclude that activation of RelA is required for homeostatic regulation of cell death and division in intestinal epithelia, as well as for protection from development of severe, acute inflammation of the intestine. Control of gene expression by NF-κB is essential for appropriate cellular responses to a wide variety of stimuli and often has seemingly contradictory roles in initiation and resolution of inflammatory disease (1, 2, 3). NF-κB functions as a dimeric transcription factor whose subunits are RelA, RelB, c-Rel, p50/NF-κB1, and p52/NF-κB2. Heterodimers of RelA/p50 are primary mediators of NF-κB-target gene expression, although functional redundancy may be possible through contributions of c-Rel or RelB (4, 5). In an unstimulated state, NF-κB is sequestered in the cytoplasm through association with inhibitors of κB (IκBα, IκBβ, IκBε, NF-κB1, and NF-κB2). Upon signal-dependent phosphorylation and proteolysis, IκB proteins release the NF-κB dimer for accumulation in the nucleus and DNA binding. Sufficient steady-state levels and timely resynthesis of IκB is thought to be critical for proper temporal control of NF-κB-mediated gene expression (6, 7). NF-κB activation, such as that induced by TNF-α, is largely dependent on the activity of IκB kinase (IKK)3 proteins (2). The IKK complex typically consists of IKKα and IKKβ, which have enzymatic activity, and IKKγ/NEMO, which is required for complex formation and stability. These proteins encompass most, but not all, cellular IκB kinase activity (2). The complex relationship between IKK activity and NF-κB regulation is especially relevant to inflammatory disease, in which multiple pathways of NF-κB activation may be induced, both IKK mediated and IKK independent (8). Accumulating evidence indicates that in genetically susceptible individuals, the initiating events in chronic, recurring intestinal inflammation may be a pathological synergy between defective innate immune responses and uncontrolled lamina propria mononuclear and T cell activation (9). The intestinal epithelial cell (IEC) monolayer is essential to mucosal innate immunity via its role in barrier function, antimicrobial peptide production, and regulation of mucosal immune responses to both commensal and pathogenic microflora (10, 11). Within this context, NF-κB and the signaling pathways that regulate its transcriptional activity are of central importance to both epithelial innate immunity and crosstalk between the mucosal immune system and the epithelial cell layer (12, 13, 14, 15). Critical to this are pattern recognition receptors (PRR), such as CARD15/NOD2 and TLR, which are expressed in intestinal epithelia and mucosal immune cells and are activated by bacterial products (16, 17). 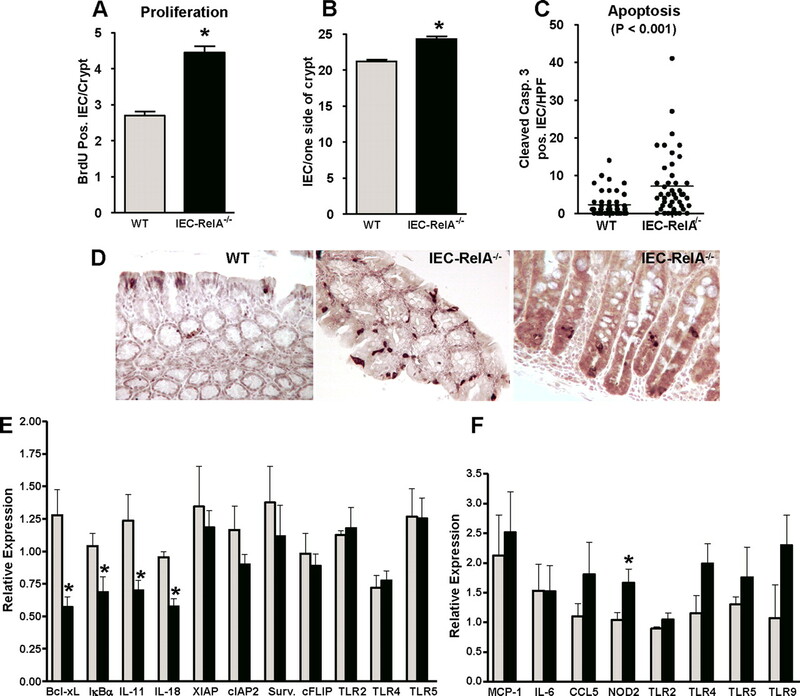 Studies of PRR-null mice, as well as animals lacking IEC expression of IKK subunits, suggest that epithelial NF-κB is critical for not only proper responses to luminal microflora, but also for maintaining tissue homeostasis in the intestine (14, 15, 16, 17, 18, 19). It is becoming increasingly clear that the barrier function of the IEC monolayer, enterocyte/immune cell communication, and epithelial cell migration following injury require fully functional NF-κB activity (20, 21). Mice lacking IKKβ or IKKγ/NEMO in IECs are susceptible to chemically induced colitis or develop spontaneous intestinal inflammation, respectively. Indications that NF-κB dimers containing the p50 subunit may be important for the IEC proliferative response required for healing mucosal injury can be seen in studies of p50-null mice that have moderately increased IEC proliferation levels (22). Importantly, mice lacking the p50 NF-κB subunit and one RelA allele (p50−/−/RelA+/−) are susceptible to pathogen-induced intestinal inflammation and are unable to resolve enteric infection (23, 24). Underscoring the need for tight control of temporal and cell type-specific NF-κB activity, gnotobiotic mice that were associated with commensal microflora showed that epithelial NF-κB was highly activated at early time points following colonization and diminished thereafter (25). Notably, this is likely very similar to effects on NF-κB activity seen in newly colonized neonatal intestine of conventionally raised mice (26). These studies collectively suggest that NF-κB (RelA/p50) activity in intestinal epithelia may be critical for mucosal responses to the initial bacterial colonization of the intestine as well as injury and infection. Unfortunately, conventional gene targeting of RelA causes embryonic lethality that must be rescued by removal of TNF-α signaling, and this has precluded work on the specific in vivo function of RelA-mediated NF-κB activity in intestinal epithelia (27, 28). To further define the role of epithelial RelA in the healthy intestine as well as during acute colonic inflammation, we have generated mice in which RelA can be eliminated from specific cell types in vivo using Cre/loxP-based recombination. Mice lacking RelA in IEC of the distal small intestine and colon (hereafter called IEC-RelA−/−) display neonatal death from spontaneous intestinal failure before weaning, although at low penetrance. Surviving adult animals have altered IEC proliferation and apoptosis and are susceptible to dextran sulfate sodium (DSS)-induced colitis. We suggest that the RelA subunit of NF-κB is required for basal homeostasis of the intestinal epithelial cell monolayer under normal physiological conditions as well as for mucosal protection and restitution during intestinal inflammation. Genomic sequences from the mouse RelA gene (MGI:103290), flanked by primer-based restriction sites, were PCR amplified from 129Sv/Ev DNA using high-fidelity polymerase (LA Taq; TaKaRa). Initially, a fragment spanning −1185 to +2091 (transcriptional start site designated +1) was cloned into a vector containing one loxP site adjacent to frt-flanked neomycin resistance and thymidine kinase expression cassettes. An additional segment of the RelA gene was then amplified with a second loxP site, and this fragment was cloned into the construct such that, upon Cre-mediated recombination, bp +2092 to +4889 would be removed. This region contains exons 5–8 of RelA and codes for most of the Rel homology domain. The construct was completed by addition of homologous sequences spanning bp +4889 to +7497. This targeting construct was then sequenced in its entirety to ensure intact RelA coding sequences as well as proper orientation and placement of loxP sites. Electroporation of this construct into 129-derived ES cells, expansion of homologously targeted clones using positive and negative antibiotic selection, and FLPe-mediated removal of the neomycin cassette was performed by the Animal Models Core at the University of North Carolina. Following identification by PCR and Southern blotting of ES cell clones with properly targeted RelA, C57BL/6J blastocysts were injected with selected clones, and mice heterozygous for the loxP-flanked RelA allele (RelAF/F) were bred from chimeric founders. Deletion of RelA from intestinal epithelia was achieved by breeding RelAF/F mice with villin-Cre transgenics (29). All mice used in these studies were re-genotyped with respect to RelA and Cre following necropsy. All studies were performed with littermate RelAF/F and RelA+/F mice designated as wild-type controls and RelAF/F;villin-Cre animals denoted as IEC-RelA−/−. Animals were housed under specific pathogen-free conditions and given autoclaved chow and filtered air and water. During the course of these studies the standard practice of assessing co-housed sentinel animals confirmed no unexpected infectious agents in this colony. This work was done in accordance with the Institutional Animal Care and Use Committees of the University of North Carolina and the Cincinnati Children’s Hospital Medical Center. Terminal ileum (∼5 cm proximal to cecum) and colon were removed from control and IEC-RelA−/− mice, rinsed with ice-cold PBS and cut open longitudinally. IECs were isolated using a low temperature protocol modified from Weiser and from Flint et al. (30, 31). Briefly, tissue was placed in chelating solution (5.0 mM Na2HPO4, 96 mM NaCl, 8 mM KH2PO4, 1.5 mM KCl, 0.5 mM DTT, 55 mM D-sorbitol, 44 mM sucrose, 6.0 mM EDTA, 5.0 mM EGTA, pH 7.3) for 30 min at 4°C, and then epithelial cells were dissociated by repeated vigorous shaking. Tissue debris was removed and IECs were collected by centrifugation at 150 × g for 10 min at 4°C. Cells were washed in cold PBS and processed for protein or RNA. Viability of primary epithelial cells was confirmed using trypan blue staining and was typically >90%. Real-time RT-PCR, immunoblotting, and DAPA were performed as previously described except for the following changes (32). SYBR Green I-based detection (QuantiTect SYBR Green Master Mix, Qiagen) and a Stratagene Mx3000P PCR machine were used for gene expression analysis. Primer sequences are: regenerating islet-derived protein (REG)III forward, 5′-TTCCTGTCCTCCATGATCAAAA-3′, RegIIIγ reverse, 5′-CATCCACCTCTGTTGGGTTCA-3′, RegIV forward, 5′-ATCAGAGAAACCTGCCTGTGTGGA-3′, RegIV reverse, 5′-AAGTGGGAAGAGTTTGTGCAAGGC-3′, defensin-related cryptdin (Defcr) 4 forward, 5′-GCTGTGTCTATCTCCTTTGGAGGC-3′, Defcr4 reverse, 5′-CGTATTCCACAAGTCCCACGAAC-3′, Defcr5 forward, 5′-AGGCTGATCCTATCCACAAAACAG-3′, Defcr5 reverse, 5′-TGAAGAGCAGACCCTTCTTGGC-3′, IL-6 forward, 5′-CAAAGCCAGAGTCCTTCAGAGAGATAC-3′, IL-6 reverse, 5′-ATTGGATGGTCTTGGTCCTTAGC-3′, IL-11 forward, 5′-GCATGTACAATGGCTGCGC-3′, IL-11 reverse, 5′-CAAGAGCTGTAAACGGCGG-3′, IL-18 forward, 5′-CAGGCCTGACATCTTCTGCAA-3′, IL-18 reverse, 5′-TCTGACATGGCAGCCATTGT-3′, CXCL1 forward, 5′-CCCAAACCGAAGTCATAGCCACAC-3′, CXCL1 reverse, 5′-TTGTCAGAAGCCAGCGTTCACCAG-3′, CXCL5 forward, 5′-AGCTGCGTTGTGTTTGCTTAACCG-3′, CXCL5 reverse, 5′-TTGAACACTGGCCGTTCTTTCCAC-3′, CXCL10 forward, 5′-GCCGTCATTTTCTGCCTCAT-3′, CXCL10 reverse, 5′-GCTTCCCTATGGCCCTCATT-3′, TNF-α forward, 5′-AGGCAGGTTCTGTCCCTTTCAC-3′, TNF-α reverse, 5′-AGATAGCAAATCGGCTGACGG-3′, RANTES reverse, 5′-AGCAAGCAATGACAGGGAAGC-3′, RANTES forward, 5′-CAAGGAGTATTTCTACACCAGCAGC-3′, APRIL forward, 5′-GTGATGTGGCAACCAGCTCTT-3′, APRIL reverse, 5′-CCCTTGGTGTAAATGGAAGAC-3′, thymic stromal lymphopoietin (TSLP) forward, 5′-AGGAGCCTCTTCATCCTGCAAGTA-3′, TSLP reverse, 5′-TGTGCCATTTCCTGAGTACCGTCA-3′, NOD2 forward, 5′-TGAAGTTGTAGCCGACCACCAGAA-3′, NOD2 reverse, 5′-TCCCTGGAGCTCAGTGTTTGGATT-3′, TLR2 forward, 5′-AAGAGGAAGCCCAAGAAAGC-3′, TLR2 reverse, 5′-CGATGGAATCGATGATGTTG-3′, TLR4 forward, 5′-ACCTGGCTGGTTTACACGTC-3′, TLR4 reverse, 5′-CTGCCAGAGACATTGCAGAA-3′, TLR5 forward, 5′-TCAGAGCACCTACGCTTGGAACAT-3′, TLR5 reverse, 5′-AGTGGAAATGATGTGGCAACCACC-3′, TLR9 forward, 5′-ACTGAGCACCCCTGCTTCTA-3′, TLR9 reverse, 5′-AGATTAGTCAGCGGCAGGAA-3′, Bcl-xL forward, 5′-TAAACTGGGGTCGCATCGTG-3′, Bcl-xL reverse, 5′-GTGGTTCTCCTGGTAGCAATGG-3′, c-FLIP forward, 5′-TGAGTCGTTAGGTAGCCAGTTGG-3′, c-FLIP reverse, 5′-TGTTCCACGCATACACTTTGTCC-3′, BIRC3 forward, 5′-TGGCCTGATGCTAGACAACTGGAA-3′, BIRC3 reverse, 5′-TAGGGACTTGTGCTCAAAGCAGGA-3′. Immunoblotting was performed using the following Abs: RelA SC-372, p50 SC-114, c-Rel SC-70, IκBα SC-371, IκBβ SC-945, COX-2 SD-1747 (Santa Cruz Biotechnology) and cleaved caspase-3 no. 9661 (Cell Signaling Technology). In some studies, protein extracts were isolated 90 min after mice had been injected i.p. with LPS (2.5 μg/g Escherichia coli O55:B5, Sigma-Aldrich). For DAPA, 50 μg of nuclear extract from ileum or colon was incubated with 1.0 μM biotinylated DNA duplex containing a consensus κB site (5′-ACTGGCTTGGAAATTCCCCGCGCCTGACC-3′) from the mouse IκBα promoter. DNA binding assays on RelA siRNA knockdown cells were done with 20 μg of nuclear extracts. Incubations were performed in EMSA DNA binding buffer (50 mM NaCl, 10 mM Tris (pH 7.6), 10% glycerol, 1 mM DTT, 0.5 mM EDTA) containing proteinase and phosphatase inhibitors (Sigma-Aldrich) as well as 0.1 μg/ml poly(dI-dC) at 4°C overnight. Preincubation of extracts with excess nonbiotinylated κB duplexes confirmed specificity. Duplex–protein complexes were purified using 100-μl Streptavidin MagneSphere Paramagnetic beads (Promega) and a magnetic column and washed with DNA-binding buffer three times. Isolated proteins were fractionated on 4–12% NuPAGE gels (Invitrogen) and immunoblotted for p50, c-Rel, or RelA. Intestinal inflammation was induced by providing transgenic or control littermate mice with 3% DSS water (m.w. 36,000–50,000; MP Biomedicals) for either 7 days for acute studies or 5 days followed by 5 days of water for healing phase studies. Female mice were used for short-term experiments, and male animals were used for resolution studies. As has been reported, male mice, independent of genotype, were significantly more susceptible to DSS colitis (33). Animal weights and stool scores (0, normal; 1, soft; 2, diarrhea/minimal anorectal bleeding; 3, diarrhea/severe anorectal bleeding) were recorded daily. Although DSS injury occurs throughout the colon and cecum at varying levels, the distal colon is a primary site of injury (33). Therefore, mice were sacrificed, the cecum and colon were removed and flushed with ice-cold PBS, and the distal portion of the colon was cut into three equal segments and fixed in 10% formalin. The cecum was frozen for later analysis. For each distal colon sample, longitudinal cuts of tissue in which the three distal colon sections had clearly visible intestinal lumen were used in histological scoring with the observer blinded to genotype. Scoring parameters were modified from Cooper et al. and Hogan et al. and included quantitation of the area of distal colon involved, edema, erosion/ulceration of the epithelial monolayer, crypt loss/damage, and infiltration of immune cells into the mucosa (34, 35). Severity was graded on a scale that, for the area involved (erosion/ulceration and crypt loss), was defined as 0 (normal), 1 (0–10%), 2 (10–25%), 3 (25–50%), and 4 (>50%). Edema and immune cell infiltration were scored as: 0, absent; 1, weak; 2, moderate; and 3, severe. Total disease score was expressed as the mean of all combined scores per genotype. Immunohistochemistry was performed as previously described with the following alterations (36). Quantitation of cleaved caspase-3 staining in epithelial cells of the distal colon was performed in a blinded manner by counting positive cells in multiple random microscope fields (100×) per tissue section (Fisher Micromaster digital microscope and Micron imaging software; Fisher Scientific). BrdUs taining was performed as suggested by the manufacturer (BrdU staining kit; Invitrogen). Mice were injected with 50 μg BrdU/g body weight 1.5 h before sacrifice and processed for immunohistochemisry as above. Properly oriented crypts, defined as those with a clear cell column lining both sides of an open luminal area, were photographed and the number of BrdU-positive cells per crypt, as well as cells on one crypt side, were counted by an observer who was unaware of sample genotype. Microphotographs of histologically stained sections were taken on an Axioplan 2 microscope (Carl Zeiss MicroImaging). Knockdown of mouse RelA was performed in m-ICcl2 cells, a nontransformed mouse intestinal cell line (37). m-ICcl2 cells were grown in DMEM/Ham’s F12, 60 nM sodium selenate, 5 μg/ml transferrin, 2 mM glutamine, 50 nM dexamethasone, 1 nM triiodothyronine, 5 μg/ml insulin, 20 mM D-glucose, 10 nM epidermal growth factor, 2% FCS, and 20 mM HEPES (pH 7.4). Lipofectamine 2000 (Invitrogen) was used for transfection of RelA-specific siGENOME ON-TARGET SMARTpool (L-040776-0, Dharmacon) into m-ICcl2 cells at a concentration of 100 nM. Control cells received nonspecific siRNA. Pilot studies indicated that when transfections were done with the cells in suspension at the time of passaging, effective knockdown of RelA could be obtained after 72 h. TNF-α treatment (20 ng/ml, Peprotech) and nuclear extracts were isolated as previously described (32). In some studies, an NF-κB luciferase reporter, mutant reporter. and IκBα-serine 32/36 to alanine mutant (IκBα-SR) plasmids were cotransfected with siRNA. Colonic organ cultures were performed by harvesting distal colon from control and IEC-RelA−/− mice given water or DSS for 7 days. Tissue was flushed with cold PBS and mesentery was removed. One-centimeter sections of colon were weighed and placed in 24-well plates containing DMEM, 0.5% FBS, penicillin (100 U/ml), streptomycin (100 μg/ml), Fungizone (0.25 μg/ml) (Invitrogen), and Primocin (50 μg/ml) (InvivoGen). Once all study tissue was collected, media was replaced and explants were incubated overnight at 37°C. Supernatants were collected, cleared by centrifugation, and PGE2 levels were measured by ELISA (Cayman Chemical). All values are presented as mean ± SE. All comparisons are made between control and IEC-RelA−/− mice using the unpaired Student t test. Differences were considered statistically significant at p < 0.05. Defining the physiological role of RelA in fully developed tissue has been difficult due to the TNF-α-dependent hepatocyte apoptosis and embryonic lethality that occurs in mice lacking this subunit of NF-κB (27, 28). Therefore, to investigate the role of RelA in a tissue-specific manner, we targeted the murine RelA locus with a conditional loxP-based allele that would allow removal of a major portion of the RelA genomic coding sequence upon in vivo expression of Cre recombinase. A targeting vector was designed in which exons 5–8 were flanked by loxP sequences (Fig. 1⇓A). This portion of the RelA gene was selected for deletion because these exons code for the majority of the Rel homology domain that is essential for DNA binding activity as well as for dimerization of RelA with other transcription factors. Additionally, following Cre recombinase-mediated removal of exons 5–8, possible splicing from the now adjacent exons 4 and 9 results in an out-of-frame transcript with multiple and immediate stop codons, thereby lessening the likelihood of producing a truncated RelA protein with potentially hypomorphic or dominant negative properties. Homozygous mice with this conditional, loxP-flanked, or “floxed” RelA gene (RelAF/F) are born in expected Mendelian ratios and are indistinguishable from wild-type mice. Intestinal epithelial cell-specific deletion of RelA and histological analysis of control and IEC-RelA−/− littermate mice at 10–12 days of age. A, Targeting strategy for Cre/loxP-mediated removal of RelA exons is shown with PCR primer sites that were used to confirm intestine-specific recombination in IEC-RelA−/− mice. B, Recombination of RelA allele in ileum of IEC-RelA−/− mice but not in liver (Liv), spleen (Spl), or kidney (Kid). C, Full-length blot shows complete loss of RelA protein in extracts from primary epithelia of intestine-specific RelA-null mice and indicates that no truncated forms of RelA are produced. D, Immunohistochemistry with RelA-specific Abs identifies RelA in the nuclei of deep crypt epithelia (arrows, left panel). RelA is lost from epithelial cells (middle panel; asterisks in crypt lumen) but it is evident in surrounding cells of lamina propria and stroma (arrowheads). The negative control was performed with no primary Ab (right panel). Alkaline phosphatase activity (E), immunohistochemistry analysis of lysozyme (F), and chromagranin A (G) and staining with Alcian blue (H and I) and hematoxylin and eosin (J and K) suggest no overt alterations in IEC differentiation with loss of RelA (left panel is control and right panel is IEC-RelA−/− for E–K). L and M, A subset of IEC-RelA−/− mice present with apparent intestinal distress. Hematoxylin-and-eosin staining shows loss of ileal crypt-villus morphology (compare M to K). With the goal of investigating the role of RelA in physiological maintenance of the intestinal epithelial cell layer as well as its response to inflammation, RelAF/F mice were bred with transgenic animals that express the Cre recombinase under the control of villin gene regulatory sequences. The villin-Cre transgene targets all epithelial cell lineages of the distal small intestine, cecum, and colon, and expression occurs in intestinal crypt stem cells beginning before birth (29). IEC-RelA−/− mice were generated and survived development in expected genetic ratios. PCR analysis revealed, as expected, that rearrangement of the RelA allele did not occur in liver, spleen, kidney, lung, and skin but was present in the intestine (Fig. 1⇑B and data not shown). Although some IEC-RelA−/− mice present with gastrointestinal disease before weaning (see results below), most mice lacking RelA in ileal and colonic epithelia survive to adulthood. We confirmed complete loss of RelA protein in the IEC monolayer by Western blotting of whole-cell extracts from isolated colonic epithelial cells of adult mice (Fig. 1⇑C). The occasional trace amounts of RelA that remain are likely due to the previously characterized low levels of mosaic expression of the villin promoter-driven Cre enzyme or to the unavoidable small amounts of contaminating nonepithelial cells inherent to IEC isolation. In no instance did we note the appearance of smaller molecular weight species when using several RelA Abs in IECs from IEC-RelA−/− mice, suggesting that Cre-mediated recombination of the conditional allele results in complete loss of RelA protein production (Fig. 1⇑C and unpublished data). As reported by others (22), immunohistochemical analysis of the intestine showed that the RelA protein is expressed in a diffuse pattern in colonic epithelia and is localized to the nucleus of cells at the base and lower third of the crypt (Fig. 1⇑D). Staining for RelA in IEC-RelA−/− mice showed that, as expected, Cre-mediated deletion is specific to the epithelial cell layer. Because of the well-described role for NF-κB in differentiation of various cell types (38), we initially assessed IEC cell-type specification in control and IEC-RelA−/− ileum and colon of apparently healthy 10–12-day-old mice. Alkaline phosphatase activity was present in differentiated villus epithelia in both control littermate and IEC-RelA−/− ileum (Fig. 1⇑E). Immunohistochemistry for lysozyme showed staining in small-bowel crypts and indicated no defects in Paneth cell numbers in wild-type and IEC-RelA−/− mice (Fig. 1⇑F). Furthermore, chromogranin A and Alcian blue staining also indicated no substantial genotype-based difference in numbers of enteroendocrine cells in the ileum (Fig. 1⇑G) or of goblet cells in either the small or large intestine (Fig. 1⇑, H and I). Hematoxylin-and-eosin staining of ileum and colon also indicated no gross abnormalities in intestinal morphology in neonatal mice (Fig. 1⇑, J and K). Despite the seemingly normal development of the epithelial cell layer in IEC-RelA−/− pups, we observed that ∼10–15% of IEC-RelA−/− mice displayed abdominal discoloration and diarrhea, which began within 2–3 days after birth. This resulted in poor weight gain (10–12-day-old wild type, 6.6 ± 0.15 g; unaffected IEC-RelA−/−, 6.1 ± 0.09 g; runted IEC-RelA−/−, 3.5 ± 1.1 g; n = 3–6 per genotype). These mice died before day 25. Upon closer examination, severe gastrointestinal pathology was apparent and was typified by thin-walled, pale small intestine and colon that were often distended with air (Fig. 1⇑L) or filled with dark material suggestive of intestinal bleeding. Histological analysis of ileum from severely affected animals showed nearly complete loss of crypt-villus structure (Fig. 1⇑M; compare with Fig. 1⇑K). Although complete analysis of this phenotype is ongoing, we initially investigated NF-κB-dependent gene expression levels in isolated ileal IECs from 12–14-day-old control and IEC-RelA−/− pups. Importantly, IECs were purified when no visible pathology was present in an effort to determine the status of NF-κB-target genes before disease onset, as we reasoned that this would provide an indication of the basis of this sporadic neonatal phenotype. Real-time RT-PCR analysis confirmed low expression of IκBα, an archetypal RelA-dependent gene (Fig. 2⇓). Additionally, several antiapoptotic genes such as RegIV and Bcl-xL were decreased. Other antiapoptotic NF-κB-target genes such as survivin and X-linked inhibitor of apoptosis (XIAP) were unaffected (Fig. 2⇓ and data not shown). These results imply that the absence of RelA in the epithelial cell layer may confer susceptibility to stress-induced cell death (39, 40). Genes regulated by the presence of luminal microflora such as Reg3γ, Defcr4, and Defcr5 are also expressed at low levels in ileal epithelia of IEC-RelA−/− pups as compared with littermate controls (16, 41). Collectively, these data suggest that, although epithelial cell differentiation occurs normally, loss of RelA-mediated gene expression may result in susceptibility to neonatal intestinal failure. Decreased levels of antimicrobial and antiapoptotic RelA/NF-κB-dependent genes in IEC-RelA−/− mice. Real-time RT-PCR was performed on mRNA from isolated enterocyte of apparently healthy 12–14-day-old control and IEC-RelA−/− pups relative to littermate controls. Surv., survivin (n = 4–7 mice per group; ∗, p < 0.05). Previous studies suggest that the total cellular NF-κB transcriptional activity is highly sensitive to loss of individual subunits and that basal activity equilibrates through coordinated alterations in protein levels and DNA binding activity of the remaining IκB/NF-κB complexes (4, 6). Because potentially compensatory NF-κB activity is critical for understanding the effects of loss of RelA in intestinal epithelial cells, we examined IκB proteins as well as the NF-κB subunits p50 and c-Rel in isolated primary cells lacking RelA. As expected (27, 42), RelA deletion in colonic epithelia had no effect on total cellular levels of p50 or c-Rel but did result in dramatically decreased levels of IκBα and IκBβ (Fig. 3⇓A). Next, we isolated nuclear extracts from colonocytes of untreated or LPS-injected control and IEC-RelA−/− mice and examined nuclear translocation and DNA binding activity of relevant NF-κB subunits. Although the anticipated nuclear accumulation of p50, c-Rel, and RelA was apparent in endotoxin-treated control mice, IECs lacking RelA had elevated translocation of c-Rel and p50 (Fig. 3⇓B). Notably, the DNA binding potential of the c-Rel subunit of NF-κB in intestinal epithelia is thought to be, under normal conditions, low or absent (22, 32). However, as measured by DNA affinity pull-down assays, loss of RelA leads to a shift in the composition of bound NF-κB dimers with substantial c-Rel and p50 binding in epithelia of both ileum (data not shown) and colon (Fig. 3⇓, C and D). This suggests that c-Rel/p50 may control expression of a subset of NF-κB-dependent genes in the RelA-null intestine. To confirm the presence of potentially compensatory NF-κB activity in IECs lacking RelA, we used a more easily controlled in vitro system in which RNA interference was used to greatly diminish RelA protein levels. Knockdown of RelA in the nontransformed mouse intestinal cell line m-ICcl2 resulted in coordinately decreased stability of IκBα and IκBβ protein in unstimulated cells (Fig. 3⇓E). Similarly, the lack of significant levels of nuclear RelA upon TNF-α treatment resulted in elevated c-Rel DNA binding activity (Fig. 3⇓E, lower panel) and suggested that this system was a valid model of in vivo conditions. NF-κB luciferase reporter assays indicated that, although decreased RelA protein significantly blunted luciferase production, both basal and TNF-α-induced NF-κB activity remain (Fig. 3⇓F). Coexpression of a stabilized IκBα mutant (IκBα-SR) resulted in complete loss of NF-κB-mediated luciferase activity and confirms that the remaining reporter gene expression was NF-κB, and likely c-Rel/p50, dependent (Fig. 3⇓F). Having determined that loss of RelA results in a shift in the predominant NF-κB subunit composition and activity in intestinal epithelia, we next determined the impact that this had on cell survival and division of RelA-null IECs. Enhanced NF-κB (c-Rel/p50) activity in intestinal epithelia lacking RelA. A, Immunoblotting of extracts from isolated primary colonocytes of three control and three IEC-RelA−/− mice shows loss of RelA and decreased levels of IκBα and IκBβ. Whole-cell levels of p50 and c-Rel are unchanged. B, Control and IEC-RelA−/− mice were injected with LPS (2.5 μg/g), and IEC nuclear extracts from colon were isolated 90 min later and immunoblotted. C, DNA affinity pull-down assay on nuclear extracts from isolated colon epithelial cells of LPS-injected control and IEC-RelA−/− mice. Competition with excess nonbiotinylated NF-κB site DNA duplexes shows specificity (D). E, Immunoblot of whole-cell extracts from m-ICcl2 cells transfected with RelA siRNA. RelA knockdown (RelA-KD) coincided with decreased IκBα and IκBβ (upper panel). DNA affinity pull-down assay in control and RelA-KD cells showed RelA and c-Rel binding following TNF-α stimulation (20 ng/ml) for 60 min (lower panel). 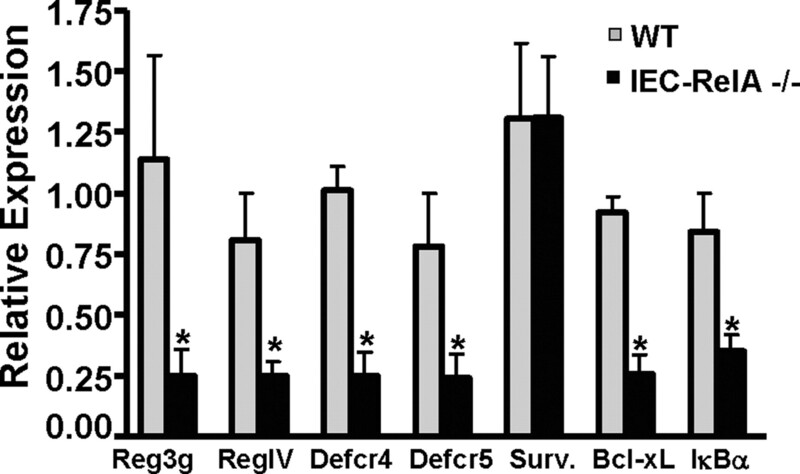 F, NF-κB luciferase reporter assay in control and RelA-deficient cells. Luciferase reporter assays using plasmids containing an NF-κB-responsive (Luc) or NF-κB mutant (Mut) promoter as well as stabilized mutant IκBα (IκB-SR). The specific gene expression defects identified in neonatal intestine, along with previous work in p50 and IEC-IKKγ/NEMO-null mice (14, 22), support the possibility that deregulation of basal proliferation and apoptosis may be present in surviving, adult IEC-RelA−/− mice. Therefore, we determined rates of IEC turnover in adult control and IEC-RelA−/− intestine. Proliferation was measured by determining the average number of BrdU-labeled cells per well-oriented crypt in the distal colon of IEC-RelA−/− and wild-type littermate mice. Loss of RelA in the colon results in increased proliferation, with IEC-RelA−/− mice having nearly twice the number of mitotic cells as compared with control animals (Fig. 4⇓A). Despite this significant increase in dividing cells in RelA-null crypts, only a moderate increase in IECs per crypt was detected (Fig. 4⇓B). This led us to investigate whether the increased proliferation in this cell layer was accompanied by elevated apoptosis. Immunohistochemical staining for cleaved caspase-3 was performed on tissue sections from IEC-RelA−/− and control mice and was quantified by counting positive epithelial cells in random high-power microscope fields. The RelA-null epithelial monolayer had elevated numbers of apoptotic cells that were predominantly crypt epithelia, suggesting a protective role for RelA in intestinal stem or progenitor cells that cannot be compensated for by enhanced c-Rel activity (Fig. 4⇓C). Large clusters of apoptotic epithelial cells were found in IEC-RelA−/− mice, and most crypts had numerous cells with activated caspase-3 (Fig. 4⇓D). 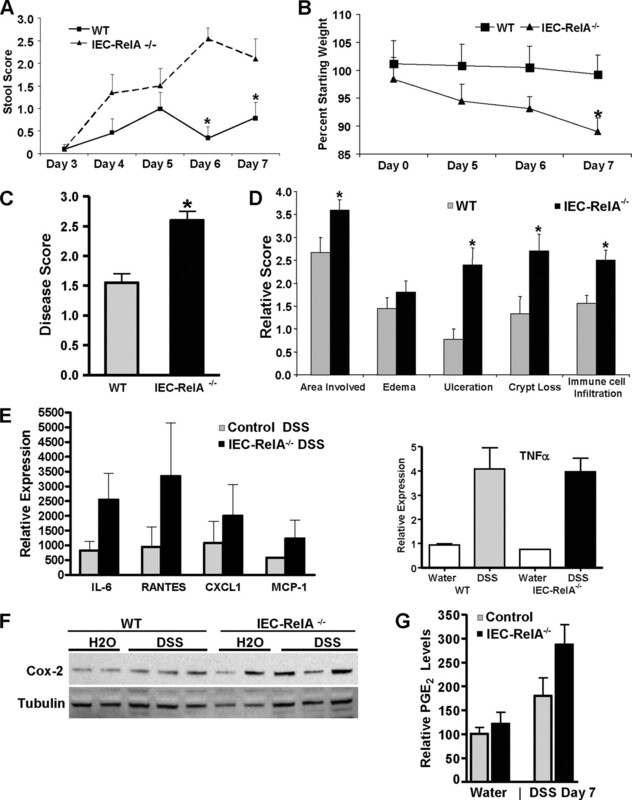 Altered proliferative and apoptotic homeostasis in IEC-RelA−/− intestine. A, Proliferation of intestinal epithelial cells in mature IEC-RelA−/− mice is elevated when compared with controls as determined by counting BrdU-positive cells per properly oriented distal colon crypt (n = 5 mice and ≥143 crypts counted per group). B, Number of cells on one side of distal colon crypts from base to surface were increased in IEC-RelA−/− vs control mice (n = 5 mice and ≥120 crypts per group). C, Epithelial apoptosis was measured in the distal colon by counting cleaved caspase-3-positive cells per 100× high power field (HPF) and was found to be increased in IEC-RelA−/− mice (n = 5 mice per group with nine fields counted per mouse). D, Immunohistochemistry for cleaved caspase-3 shows low levels of cell death in wild-type mice (left panel), but easily seen are areas of numerous apoptotic IECs that are commonly found in crypt epithelia of IEC-RelA−/− mouse distal colon (middle and right panels). Gene expression analysis in isolated colonocytes (E) or whole cecum (F) reveals selective loss of NF-κB-target genes (n = 6–8 per group) (∗, p < 0.05). We next investigated NF-κB-regulated gene expression in IEC-RelA−/− mice using real-time RT-PCR to determine possible causes of altered epithelial proliferation and apoptosis. Antiapoptotic Bcl-xL expression was significantly decreased in isolated RelA-null colonocytes (Fig. 4⇑E). Other NF-κB-target genes such as XIAP, cellular inhibitor of apoptosis 2, Casp8 and FADD-like apoptosis regulator (CFLAR, also called cFLIP), and survivin were not affected. We also found a notable decrease of IL-11 and IL-18 expression in isolated colonocytes of IEC-RelA−/− mice. These interleukins, which target IECs in a paracrine manner, are antiapoptotic and essential for both epithelial restitution and resistance to acute intestinal inflammation (43, 44, 45). Because activation of NF-κB by pattern recognition receptors is critically important for epithelial cell interactions with luminal microflora, we measured expression of several TLR proteins known to be expressed in colonocytes but found no differences between genotypes (Fig. 4⇑E). IEC-RelA−/− mice that reach maturity show no gross signs of intestinal disease, and yet increased epithelial cell apoptosis may lead to low levels of inflammation. Accordingly, we addressed this possibility by measuring cytokine expression in whole ceca of 12-wk-old littermate control and IEC-RelA−/− mice. No indications of altered levels of proinflammatory genes such as MCP-1/CCL2, IL-6, or RANTES/CCL5 were found (Fig. 4⇑F). Additionally, we found no changes in expression of TSLP or TNF (ligand) superfamily, member 13 (also called a proliferation-inducing ligand, or APRIL) (data not shown). These cytokines are necessary for IEC-directed dendritic cell maturation and class-switch recombination to IgA in mucosal B cells, respectively (15, 46). Of note, a significant elevation in NOD2 expression was found in ceca of IEC-RelA−/− mice, and TLR4 and TLR9 levels trended upward (p = 0.07). Additional work will be necessary to determine the possibility of aberrant immune cell presence in the mucosa of IEC-RelA−/− mice. We hypothesized that deregulated cell division and elevated apoptosis in the intestine of IEC-RelA−/− mice would result in increased susceptibility to monolayer injury, exposure of the submucosa to luminal contents, and severe inflammation. To investigate this possibility, we used an established model of chemically induced colitis (administration of DSS in drinking water) that would allow us to closely regulate the initiation of disease. Initially, control and IEC-RelA−/− mice were given 3% DSS for 2 days and then analyzed to determine susceptibility of the IEC monolayer during the initial stages of injury. We did not observe cell death in DSS-treated IEC-RelA−/− mice that was significantly greater than that seen in IECs of untreated IEC-RelA−/− animals (data not shown). Two days on DSS caused enhanced c-Rel DNA-binding activity in isolated RelA-null IECs as compared with controls (data not shown). We next determined the response of IEC-RelA−/− mice to longer DSS treatment that results in significantly elevated mucosal cytokine production and acute colitis. In these studies, we provided control and IEC-RelA−/− mice with 3% DSS drinking water for 7 days. All mice showed the expected soft stool and diarrhea but, by days 5–6, gross rectal bleeding was noted in IEC-RelA−/− mice (Fig. 5⇓A). IEC-RelA−/− mice lost significant amounts of weight as compared with control animals by study day 7 (Fig. 5⇓B). We then measured the degree of intestinal injury and inflammation in IEC-RelA−/− mice via histological examination of the distal colon. Integration of several individual scoring parameters indicated that disease severity was elevated in the intestines of mice lacking epithelial RelA (Fig. 5⇓C). IEC-RelA−/− mice displayed increased mucosal damage and immune cell infiltration as well as substantial, specific injury to the epithelial cell layer, as measured by monolayer ulceration and crypt loss (Fig. 5⇓D). We further assessed inflammation in IEC-RelA−/−-null mice by quantifying expression levels of proinflammatory cytokines and chemokines in the cecum. Although mice lacking RelA in intestinal epithelia had higher levels of IL-6 and MCP-1 following 7 days on DSS as compared with control littermate mice, some cytokines such as CXCL1 and TNF-α were found to be similar (Fig. 5⇓E). PGE2 plays an important role in mucosal response to injury, and mice lacking COX-2 are highly susceptible to DSS colitis (47, 48, 49). Therefore, we next assessed COX-2 protein levels in the distal colon of control and IEC-RelA−/− mice given DSS for 7 days. While COX-2 was moderately increased in control mice, we also found enhanced levels in RelA-null animals (Fig. 5⇓F). We next measured prostaglandin production in cell-culture media of colonic explants from water and DSS-treated mice. PGE2 production was elevated in IEC-RelA−/− tissue relative to samples from colitic control mice (Fig. 5⇓G). As seen in mice lacking enterocyte IKKβ, these data suggest that the epithelia is not the predominant site of NF-κB-mediated COX-2 expression and PGE2 production (40). Elevated levels of PGE2 produced by colitic tissue of IEC-RelA−/− mice may have important implications regarding levels of enterocyte apoptosis and proliferation (49, 50). Mice lacking intestinal RelA are highly susceptible to mucosal injury. IEC-RelA−/− and littermate control mice were given 3% DSS for 7 days and then analyzed. A and B, DSS colitis resulted in more severe stool score and weight loss in mice lacking IEC RelA (n ≥ 10 mice per genotype). C, Disease was quantitatively higher in IEC-RelA−/− mice upon histological scoring. D, Epithelial monolayer ulceration, crypt loss, and extent of immune cell infiltration were higher in IEC-RelA−/− mice (n ≥ 10 mice per genotype). E, Proinflammatory gene expression was elevated in ceca of IEC-RelA−/− mice relative to controls (n ≥ 3 mice per genotype). F, COX-2 protein levels were analyzed by immunoblot in distal colon of wild-type and IEC-RelA−/− mice on water or DSS. G, Distal colon segments from water- or DSS-treated mice were cultured for 24 h, and PGE2 levels in tissue culture media were measured by ELISA (n = 4 water and 6 DSS mice per genotype; two segments measured per mouse). Cytokine production that results from DSS treatment may further exacerbate inflammation by eroding the epithelial cell layer in IEC-RelA−/− mice. Therefore, we determined levels of apoptosis in the remaining epithelial cells of IEC-RelA−/− and control animals. Although the number of cleaved caspase-3-positive cells is more than three times higher in RelA-null epithelia (Fig. 6⇓A), this likely is an underestimation because of the significant loss of intestinal epithelia in these mice. We typically noted fewer epithelia per field in IEC-RelA−/− mice as compared with controls but still observed elevated numbers of apoptotic colonocytes. Continuous regions of cleaved caspase-3-positive epithelial cells were commonly found in IEC-RelA−/− mice, and this was consistent with the severe ulceration and crypt loss typically seen in these animals (Fig. 6⇓B). Based on the elevated levels of apoptosis seen in RelA-null IECs, we next investigated the proliferative response of control and RelA-null epithelial cell layers to DSS-induced inflammation. We found that significantly more BrdU-labeled cells were evident in IEC-RelA−/− mice (Fig. 6⇓C). Quantitation of mitotic cells in well-oriented crypts indicated that IEC-RelA−/− mice have approximately three times as many dividing cells per crypt as compared with control animals on DSS (Fig. 6⇓D). These data collectively imply an essential role for RelA-mediated NF-κB activity in antiapoptotic protection of the intestinal epithelial cell monolayer and coordinated proliferative responses to injury. RelA activity regulates apoptosis and proliferation of intestinal epithelial cells during acute inflammation. A, Enterocyte apoptosis was measure (cleaved caspase-3-positive cells per high power field (HPF)) and was highly elevated in DSS-treated IEC-RelA−/− mice (n = 6 mice per genotype and nine fields counted per mouse). B, Apoptosis is present in inflamed tissue of wild-type mice (left panel), but in IEC-RelA−/− distal colon entire layers of epithelia in areas of high immune cell numbers were cleaved caspase-3 positive (right panel). C, Although proliferation in wild-type mice was moderately elevated, large increases in BrdU-labeled cells were apparent in DSS-treated IEC-RelA−/− mice as seen by immunohistochemistry. D, Quantitation of BrdU-labeled cells confirms that the lack of RelA in inflamed tissue results in highly increased numbers of proliferating epithelial cells (n = 6 mice and ≥152 crypts counted per genotype) (∗, p < 0.05 unless otherwise stated). NF-κB activity facilitates epithelial cell migration and may mediate effective wound-healing responses (20, 21). Therefore, we speculated that loss of RelA in the intestine would result in progressive disease and tissue damage due to the inability of the epithelial monolayer to reestablish itself and limit the expansion of inflammation. We placed mice on 3% DSS for 5 days and then provided them with water for an additional 5-day recovery period. Histological characterization confirmed that IEC-RelA−/− mice had severe injury (Fig. 7⇓A). Loss of RelA resulted in large ulcerations and widespread crypt loss, whereas the epithelia of littermate control mice showed significant crypt expansion and had fewer large ulcerations (Fig. 7⇓B). With the use of immunohistochemistry, we found that the sporadic areas of epithelia regrowth in IEC-RelA−/− mice did not express RelA (data not shown), indicating that it is not absolutely required for epithelial stem cell expansion. The culminating effects of significant and early mucosal damage coupled with poor restitution of the epithelial monolayer following removal of DSS were seen in the enhanced mortality of IEC-RelA−/− mice relative to controls (Fig. 7⇓C). Closer inspection revealed that the epithelia of IEC-RelA−/− mice continued to undergo increased levels of apoptosis (Fig. 7⇓, D and E). Notably, quantitation of disease severity and levels of apoptosis in IEC-RelA−/− mice as compared with control animals may be significantly underestimated due to the decreased survival of mice lacking IEC RelA. Collectively, these data suggest that RelA is required to protect the epithelial monolayer during the initial stages of mucosal injury as well as during the reestablishment of the epithelial cell layer. However, note that the poor survival of IEC-RelA−/− mice may result from both the more extensive initial DSS-mediated injury as well as the continued loss of epithelial cells to apoptosis, factors that cannot be overcome by elevated IEC proliferation. Poor restitution of RelA-null epithelia leads to severe mucosal injury and death. Mice were given 3% DSS for 5 days followed by water for an additional 5 days and then were analyzed. A, Significant signs of epithelial regrowth were noted in wild-type mice (left panel), but IEC-RelA−/− animals had severe ulceration and crypt loss with only sporadic signs of IEC recovery in highly inflamed areas (right panel). B, Disease severity in mice given DSS and allowed to recover suggests continued epithelial cell loss in IEC-RelA−/− mice (n = 7 per genotype; ∗, p < 0.05). C, Severe initial mucosal injury and poor recovery leads to decreased survival in IEC-RelA−/− mice (n ≥ 18 mice per genotype). D, Numbers of apoptotic (cleaved caspase-3-positive) epithelial cells is elevated in IEC-RelA−/− animals (n = 3 mice per genotype with six fields counted per mouse). E, Apoptosis is present in littermate control mice (left panel), but severe depletion of the epithelial cell layer occurs due to elevated cell death in IEC-RelA−/− mice (right panel). The NF-κB/IKK signaling system provides an attractive therapeutic target based on its critical role in intestinal inflammatory diseases. However, recent work suggests that blocking IKK activity may have widely differing results in various cell types, with its loss in activated immune cells suppressing inflammation via decreased cytokine production, and epithelial-specific ablation causing apoptosis-induced barrier disruption and initiation of mucosal inflammation (14, 40, 51). Additionally, as the number of IKK substrates grows, it is now clear that the IKK subunits have both pro- and anti-inflammatory functions as well as NF-κB-independent targets (3, 52, 53, 54, 55). Furthermore, determining the best approach for therapeutic manipulation of this signaling pathway in intestinal disease has been hampered by the lack of tissue-specific genetic removal of NF-κB subunits in the intestine. Using mice lacking RelA in intestinal epithelial cells, we present data indicating that RelA-mediated NF-κB activity is essential for control of proliferative and apoptotic homeostasis in the intestine. We also show that, despite the presence of c-Rel/p50 activity, the expression of a number of NF-κB-target genes involved in innate immunity is lost in IEC-RelA−/− animals. Evidence for the sensitivity of these animals to intestinal pathology can be seen in the increased levels of perinatal disease and death of IEC-RelA−/− mice as well as sensitivity of adult animals to chemically induced colitis. These data support a protective role of epithelial RelA/NF-κB activity during acute intestinal inflammation but also have implications for its suitability as a drug target due to its functional importance in maintaining the normal physiology of the resting, unchallenged intestine. An important mechanistic basis for the catastrophic intestinal phenotype seen in some IEC-RelA−/− neonatal mice may be the loss of coordinated IκB/NF-κB feedback regulation. We demonstrate low levels of IκBαβ proteins in IECs lacking RelA as well as elevated nuclear localization and DNA binding activity of c-Rel/p50. A primary role for IκBα and IκBβ is to block the DNA binding potential of NF-κB, and it is evident that these proteins are required for coordinated gene activation and deactivation (6, 7, 56). For example, loss of IκBα results in sustained NF-κB activity in vitro as well as widespread inflammatory disease in mice (4, 6, 57). Maintaining sufficient levels of IκB activity may be especially important in intestinal epithelia where tolerance to PRR ligands through properly controlled NF-κB activity is likely mediated by stabilization of IκB (17, 58, 59). In the developing epithelia of mice and preterm infants, low levels of IκBα/β protein are a suggested driving force in the deregulated NF-κB activity, enhanced cytokine production, and uncontrolled inflammation of necrotizing enterocolitis (12, 60). Although our data are consistent with enhanced c-Rel/p50-mediated proinflammatory gene expression driving intestinal disease in IEC-RelA−/− mice, other possibilities exist. For example, normally innocuous neonatal stress, along with loss of RelA-mediated antimicrobial and antiapoptotic gene expression in the maturing intestine, may result in elevated apoptosis of the epithelial cell layer. The subsequent loss of barrier function could lead to increased exposure of mucosal immune cells to luminal contents and uncontrolled intestinal inflammation similar to that seen in mice lacking IEC expression of IKKγ/NEMO (14). A primary difference between the IEC-RelA−/− mice described here and the recently reported IEC-IKKγ/NEMO−/− animals with respect to the frequency of spontaneous inflammation may be the presence of compensatory c-Rel-mediated antiapoptotic gene expression that, in the absence of a stochastic, disease-initiating event early in life, allows for relatively unaffected IEC-RelA−/− animal growth (22). Additional work will be necessary to define the consequences of RelA deletion in neonatal enterocytes during the initial coordination of mucosal innate and adaptive immune responses. Understanding the function of epithelial RelA, as well as other NF-κB subunits, in the developing intestine may have direct relevance to the pathogenesis of necrotizing enterocolitis. Our data clearly demonstrate that in adult animals, IEC RelA/NF-κB plays a protective role during intestinal inflammation and this likely occurs through regulation of antiapoptotic gene expression and wound healing. Decreased production of two protective interleukins that are expressed in IECs, IL-18 and IL-11, may have profound effects on antiapoptosis and mucosal restitution in IEC-RelA−/− mice. Animals lacking IL-18 are susceptible to DSS-induced colitis due to poor mucosal repair and are unable to elevate IL-11, an established target gene of IL-18 signaling (44, 61). IL-11, in turn, is highly increased during experimental colitis, and expression of the IL-11 receptor in the intestine is mainly found in IECs. Activation of Akt signaling by IL-11 in colonic epithelia has potent antiapoptotic activity (45, 61). Additionally, loss of Bcl-xL expression in IECs of neonatal and adult IEC-RelA−/− mice is consistent with the elevated basal levels of apoptosis that we observed in these animals. It is possible that c-Rel compensates for loss of RelA in basal expression of some antiapoptotic NF-κB-target genes such as cFLIP, XIAP, and survivin. 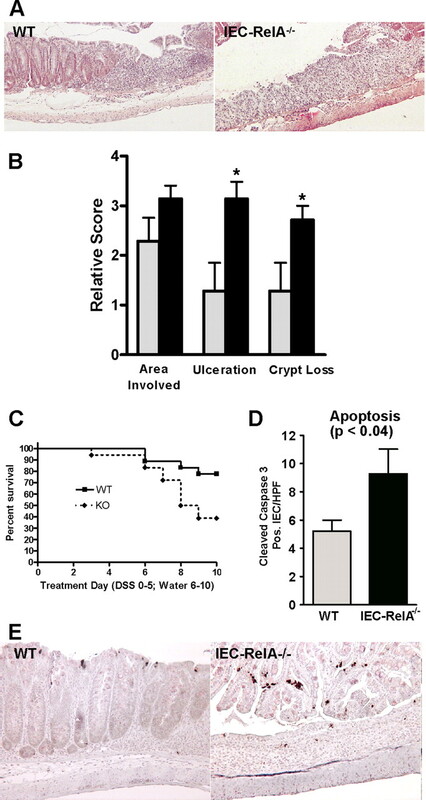 Further work is required to determine whether, under the significant stress of elevated cytokine production and DNA damage associated with experimental murine colitis (62, 63), the ability of c-Rel to provide some measure of antiapoptotic gene expression is surpassed, resulting in widespread epithelial cell death. IEC-RelA−/− mice given DSS have significant IEC apoptosis, and this results in poorly resolving injury to the intestinal mucosa that often results in animal death. These data are highly similar to those seen in intestine-specific ablation of IKK subunits. Mice lacking IKKβ in intestinal epithelia have more severe inflammation and ulceration in response to DSS challenge that correlated with increased apoptosis and loss of Bcl-xL expression (40). We report herein a large increase in proliferation of the RelA-null epithelial cell layer in response to inflammation. It seems likely that, as shown previously in hepatocyte-null IKKβ mice, the proliferative response in IEC-RelA−/− animals may be secondary to elevated JNK-induced apoptosis (64). Although present at much lower levels, the moderately elevated IEC apoptosis seen in unchallenged IEC-RelA−/− mice resembles that which is thought to initiate colitis in mice with ablated epithelial expression of IKKγ/NEMO. However, a significant difference between mice lacking IKKβ or IKKγ/NEMO in IECs and the IEC-RelA−/− mice described herein is the continued presence of undiminished IKK complex activity, decreased IκB proteins, and altered c-Rel/p50 NF-κB transcriptional potential. This may be especially relevant in light of the well-understood role for c-Rel in proliferation and oncogenesis (65). Accordingly, the elevated proliferative response and uncontrolled inflammation seen in IEC-RelA−/− mice suggest that RelA may have an important role in tumor initiation in the intestine and may be critical in the context of colitis-associated colorectal cancer. It is increasingly evident that the IKK/NF-κB signaling pathway is an important mediator of mucosal homeostasis. Decreased epithelial IKK activity and, as we have shown, deletion of RelA/NF-κB result in defective antimicrobial and antiapoptotic gene expression, elevated proliferation and cell death of epithelia, and susceptibility to intestinal inflammation. Collectively, it is apparent that IKK/NF-κB activity in the intestinal epithelia is required for suppression of microflora-induced inflammation in early life, as well as for effective mucosal immune responses to infection and injury in adult animals. Although inhibition of NF-κB and its upstream signaling kinases may be a highly effective means of decreasing the severity of active, chronic inflammation, loss of NF-κB-mediated gene expression in epithelial cells may have detrimental effects on the initiation, as well as the eventual resolution, of inflammatory disease. We thank Dr. Daniela Basseres for technical assistance and helpful discussions, Dr. Dan Wiginton and Mary Dusing for reagents, and Drs. Mitchell Cohen, Lee Denson, and Christian Jobin for manuscript comments. ↵1 This work was supported in part by grants from the American Cancer Society, Crohn’s and Colitis Foundation of America, and University of North Carolina Center for Gastrointestinal Biology and Disease Pilot and Feasibility Grant P30 DK34987 (to K.A.S. ), and by National Institutes of Health Grants R01 AI35098, R01 CA73756, and R01 CA75080 (to A.S.B.). A.S.B. is an investigator of the Samuel Waxman Cancer Research Foundation. ↵3 Abbreviations used in this paper: IKK, IκB kinase; DAPA, DNA affinity protein-binding assay; Defcr, defensin-related cryptdin; DSS, dextran sulfate sodium; IEC, intestinal epithelial cell; PRR, pattern recognition receptor; Reg, regenerating islet-derived protein; TSLP, thymic stromal lymphopoietin; XIAP, X-linked inhibitor of apoptosis. Perkins, N. D., T. D. Gilmore. 2006. Good cop, bad cop: the different faces of NF-κB. Cell Death Differ. 13: 759-772. Hoffmann, A., T. H. Leung, D. Baltimore. 2003. Genetic analysis of NF-κB/Rel transcription factors defines functional specificities. EMBO J. 22: 5530-5539. Sanjabi, S., K. J. Williams, S. Saccani, L. Zhou, A. Hoffmann, G. Ghosh, S. Gerondakis, G. Natoli, S. T. Smale. 2005. A c-Rel subdomain responsible for enhanced DNA-binding affinity and selective gene activation. Genes Dev. 19: 2138-2151. Tergaonkar, V., R. G. Correa, M. Ikawa, I. M. Verma. 2005. Distinct roles of IκB proteins in regulating constitutive NF-κB activity. Nat. Cell. Biol. 7: 921-923. Karin, M., T. Lawrence, V. Nizet. 2006. Innate immunity gone awry: linking microbial infections to chronic inflammation and cancer. Cell 124: 823-835. Strober, W., I. Fuss, P. Mannon. 2007. The fundamental basis of inflammatory bowel disease. J. Clin. Invest. 117: 514-521. Ponda, P. P., L. Mayer. 2005. Mucosal epithelium in health and disease. Curr. Mol. Med. 5: 549-556. Karrasch, T., C. Jobin. 2007. NF-κB and the intestine: friend or foe?. Inflamm. Bowel Dis. 14: 114-124. Claud, E. C., L. Lu, P. M. Anton, T. Savidge, W. A. Walker, B. J. Cherayil. 2004. Developmentally regulated IκB expression in intestinal epithelium and susceptibility to flagellin-induced inflammation. Proc. Natl. Acad. Sci. USA 101: 7404-7408. Fichtner-Feigl, S., I. J. Fuss, J. C. Preiss, W. Strober, A. Kitani. 2005. Treatment of murine Th1- and Th2-mediated inflammatory bowel disease with NF-κB decoy oligonucleotides. J. Clin. Invest. 115: 3057-3071. Nenci, A., C. Becker, A. Wullaert, R. Gareus, G. van Loo, S. Danese, M. Huth, A. Nikolaev, C. Neufert, B. Madison, et al 2007. Epithelial NEMO links innate immunity to chronic intestinal inflammation. Nature 446: 557-561. Kobayashi, K. S., M. Chamaillard, Y. Ogura, O. Henegariu, N. Inohara, G. Nunez, R. A. Flavell. 2005. Nod2-dependent regulation of innate and adaptive immunity in the intestinal tract. Science 307: 731-734. Lee, J., J. H. Mo, K. Katakura, I. Alkalay, A. N. Rucker, Y. T. Liu, H. K. Lee, C. Shen, G. Cojocaru, S. Shenouda, et al 2006. Maintenance of colonic homeostasis by distinctive apical TLR9 signalling in intestinal epithelial cells. Nat. Cell. Biol. 8: 1327-1336. Egan, L. J., A. de Lecea, E. D. Lehrman, G. M. Myhre, L. Eckmann, M. F. Kagnoff. 2003. Nuclear factor-κB activation promotes restitution of wounded intestinal epithelial monolayers. Am. J. Physiol. 285: C1028-C1035. Karrasch, T., K. A. Steinbrecher, B. Allard, A. S. Baldwin, C. Jobin. 2006. Wound-induced p38MAPK-dependent histone H3 phosphorylation correlates with increased COX-2 expression in enterocytes. J. Cell. Physiol. 207: 809-815. Inan, M. S., V. Tolmacheva, Q. S. Wang, D. W. Rosenberg, C. Giardina. 2000. Transcription factor NF-κB participates in regulation of epithelial cell turnover in the colon. Am. J. Physiol. 279: G1282-G1291. Tomczak, M. F., S. E. Erdman, T. Poutahidis, A. B. Rogers, H. Holcombe, B. Plank, J. G. Fox, B. H. Horwitz. 2003. NF-κB is required within the innate immune system to inhibit microflora-induced colitis and expression of IL-12 p40. J. Immunol. 171: 1484-1492. Tomczak, M. F., M. Gadjeva, Y. Y. Wang, K. Brown, I. Maroulakou, P. N. Tsichlis, S. E. Erdman, J. G. Fox, B. H. Horwitz. 2006. Defective activation of ERK in macrophages lacking the p50/p105 subunit of NF-κB is responsible for elevated expression of IL-12 p40 observed after challenge with Helicobacter hepaticus. J. Immunol. 176: 1244-1251. Karrasch, T., J. S. Kim, M. Muhlbauer, S. T. Magness, C. Jobin. 2007. Gnotobiotic IL-10−/−;NF-κBEGFP mice reveal the critical role of TLR/NF-κB signaling in commensal bacteria-induced colitis. J. Immunol. 178: 6522-6532. Lotz, M., D. Gutle, S. Walther, S. Menard, C. Bogdan, M. W. Hornef. 2006. Postnatal acquisition of endotoxin tolerance in intestinal epithelial cells. J. Exp. Med. 203: 973-984. Beg, A. A., W. C. Sha, R. T. Bronson, S. Ghosh, D. Baltimore. 1995. Embryonic lethality and liver degeneration in mice lacking the RelA component of NF-κB. Nature 376: 167-170. Alcamo, E., N. Hacohen, L. C. Schulte, P. D. Rennert, R. O. Hynes, D. Baltimore. 2002. Requirement for the NF-κB family member RelA in the development of secondary lymphoid organs. J. Exp. Med. 195: 233-244. Madison, B. B., L. Dunbar, X. T. Qiao, K. Braunstein, E. Braunstein, D. L. Gumucio. 2002. Cis elements of the villin gene control expression in restricted domains of the vertical (crypt) and horizontal (duodenum, cecum) axes of the intestine. J. Biol. Chem. 277: 33275-33283. Weiser, M. M.. 1973. Intestinal epithelial cell surface membrane glycoprotein synthesis: I. An indicator of cellular differentiation. J. Biol. Chem. 248: 2536-2541. Flint, N., F. L. Cove, G. S. Evans. 1991. A low-temperature method for the isolation of small-intestinal epithelium along the crypt-villus axis. Biochem. J. 280: 331-334. Steinbrecher, K. A., W. Wilson, III, P. C. Cogswell, A. S. Baldwin. 2005. Glycogen synthase kinase 3β functions to specify gene-specific, NF-κB-dependent transcription. Mol. Cell. Biol. 25: 8444-8455. Mahler, M., I. J. Bristol, E. H. Leiter, A. E. Workman, E. H. Birkenmeier, C. O. Elson, J. P. Sundberg. 1998. Differential susceptibility of inbred mouse strains to dextran sulfate sodium-induced colitis. Am. J. Physiol. 274: G544-G551. Cooper, H. S., S. N. Murthy, R. S. Shah, D. J. Sedergran. 1993. Clinicopathologic study of dextran sulfate sodium experimental murine colitis. Lab. Invest. 69: 238-249. Hogan, S. P., L. Seidu, C. Blanchard, K. Groschwitz, A. Mishra, M. L. Karow, R. Ahrens, D. Artis, A. J. Murphy, D. M. Valenzuela, et al 2006. Resistin-like molecule β regulates innate colonic function: barrier integrity and inflammation susceptibility. J. Allergy Clin. Immunol. 118: 257-268. Steinbrecher, K. A., S. A. Wowk, J. A. Rudolph, D. P. Witte, M. B. Cohen. 2002. Targeted inactivation of the mouse guanylin gene results in altered dynamics of colonic epithelial proliferation. Am. J. Pathol. 161: 2169-2178. Bens, M., A. Bogdanova, F. Cluzeaud, L. Miquerol, S. Kerneis, J. P. Kraehenbuhl, A. Kahn, E. Pringault, A. Vandewalle. 1996. Transimmortalized mouse intestinal cells (m-ICc12) that maintain a crypt phenotype. Am. J. Physiol. 270: C1666-C1674. Hayden, M. S., A. P. West, S. Ghosh. 2006. NF-κB and the immune response. Oncogene 25: 6758-6780. Bishnupuri, K. S., Q. Luo, N. Murmu, C. W. Houchen, S. Anant, B. K. Dieckgraefe. 2006. Reg IV activates the epidermal growth factor receptor/Akt/AP-1 signaling pathway in colon adenocarcinomas. Gastroenterology 130: 137-149. Greten, F. R., L. Eckmann, T. F. Greten, J. M. Park, Z. W. Li, L. J. Egan, M. F. Kagnoff, M. Karin. 2004. IKKβ links inflammation and tumorigenesis in a mouse model of colitis-associated cancer. Cell 118: 285-296. Cash, H. L., C. V. Whitham, C. L. Behrendt, L. V. Hooper. 2006. Symbiotic bacteria direct expression of an intestinal bactericidal lectin. Science 313: 1126-1130. Hertlein, E., J. Wang, K. J. Ladner, N. Bakkar, D. C. Guttridge. 2005. RelA/p65 regulation of IκBβ. Mol. Cell. Biol. 25: 4956-4968. Pizarro, T. T., F. Cominelli. 2007. Cytokine therapy for Crohn’s disease: advances in translational research. Annu. Rev. Med. 58: 433-444. Takagi, H., T. Kanai, A. Okazawa, Y. Kishi, T. Sato, H. Takaishi, N. Inoue, H. Ogata, Y. Iwao, K. Hoshino, et al 2003. Contrasting action of IL-12 and IL-18 in the development of dextran sodium sulphate colitis in mice. Scand. J. Gastroenterol. 38: 837-844. Kiessling, S., G. Muller-Newen, S. N. Leeb, M. Hausmann, H. C. Rath, J. Strater, T. Spottl, K. Schlottmann, J. Grossmann, F. A. Montero-Julian, et al 2004. Functional expression of the interleukin-11 receptor α-chain and evidence of antiapoptotic effects in human colonic epithelial cells. J. Biol. Chem. 279: 10304-10315. Morteau, O., S. G. Morham, R. Sellon, L. A. Dieleman, R. Langenbach, O. Smithies, R. B. Sartor. 2000. Impaired mucosal defense to acute colonic injury in mice lacking cyclooxygenase-1 or cyclooxygenase-2. J. Clin. Invest. 105: 469-478. Brown, S. L., T. E. Riehl, M. R. Walker, M. J. Geske, J. M. Doherty, W. F. Stenson, T. S. Stappenbeck. 2007. Myd88-dependent positioning of Ptgs2-expressing stromal cells maintains colonic epithelial proliferation during injury. J. Clin. Invest. 117: 258-269. Fukata, M., A. Chen, A. Klepper, S. Krishnareddy, A. S. Vamadevan, L. S. Thomas, R. Xu, H. Inoue, M. Arditi, A. J. Dannenberg, M. T. Abreu. 2006. Cox-2 is regulated by Toll-like receptor-4 (TLR4) signaling: role in proliferation and apoptosis in the intestine. Gastroenterology 131: 862-877. Tessner, T. G., S. M. Cohn, S. Schloemann, W. F. Stenson. 1998. Prostaglandins prevent decreased epithelial cell proliferation associated with dextran sodium sulfate injury in mice. Gastroenterology 115: 874-882. Shibata, W., S. Maeda, Y. Hikiba, A. Yanai, T. Ohmae, K. Sakamoto, H. Nakagawa, K. Ogura, M. Omata. 2007. Cutting edge: The IκB kinase (IKK) inhibitor, NEMO-binding domain peptide, blocks inflammatory injury in murine colitis. J. Immunol. 179: 2681-2685. Tudhope, S. J., M. C. Catley, P. S. Fenwick, R. E. Russell, W. L. Rumsey, R. Newton, P. J. Barnes, L. E. Donnelly. 2007. The role of IκB kinase 2, but not activation of NF-κB, in the release of CXCR3 ligands from IFN-γ-stimulated human bronchial epithelial cells. J. Immunol. 179: 6237-6245. Wegener, E., A. Oeckinghaus, N. Papadopoulou, L. Lavitas, M. Schmidt-Supprian, U. Ferch, T. W. Mak, J. Ruland, V. Heissmeyer, D. Krappmann. 2006. Essential role for IκB kinase β in remodeling Carma1-Bcl10-Malt1 complexes upon T cell activation. Mol. Cell. 23: 13-23. Hu, M. C., D. F. Lee, W. Xia, L. S. Golfman, F. Ou-Yang, J. Y. Yang, Y. Zou, S. Bao, N. Hanada, H. Saso, et al 2004. IκB kinase promotes tumorigenesis through inhibition of forkhead FOXO3a. Cell 117: 225-237. Lee, S., C. Andrieu, F. Saltel, O. Destaing, J. Auclair, V. Pouchkine, J. Michelon, B. Salaun, R. Kobayashi, P. Jurdic, et al 2004. IκB kinase β phosphorylates Dok1 serines in response to TNF, IL-1, or γ radiation. Proc. Natl. Acad. Sci. USA 101: 17416-17421. Aguilera, C., R. Hoya-Arias, G. Haegeman, L. Espinosa, A. Bigas. 2004. Recruitment of IκBα to the hes1 promoter is associated with transcriptional repression. Proc. Natl. Acad. Sci. USA 101: 16537-16542. Klement, J. F., N. R. Rice, B. D. Car, S. J. Abbondanzo, G. D. Powers, P. H. Bhatt, C. H. Chen, C. A. Rosen, C. L. Stewart. 1996. IκBα deficiency results in a sustained NF-κB response and severe widespread dermatitis in mice. Mol. Cell. Biol. 16: 2341-2349. Neish, A. S., A. T. Gewirtz, H. Zeng, A. N. Young, M. E. Hobert, V. Karmali, A. S. Rao, J. L. Madara. 2000. Prokaryotic regulation of epithelial responses by inhibition of IκB-α ubiquitination. Science 289: 1560-1563. Wu, G. D., N. Huang, X. Wen, S. A. Keilbaugh, H. Yang. 1999. High-level expression of I kappa B-beta in the surface epithelium of the colon: in vitro evidence for an immunomodulatory role. J. Leukocyte Biol. 66: 1049-1056. Nanthakumar, N. N., R. D. Fusunyan, I. Sanderson, W. A. Walker. 2000. Inflammation in the developing human intestine: a possible pathophysiologic contribution to necrotizing enterocolitis. Proc. Natl. Acad. Sci. USA 97: 6043-6048. Reuter, B. K., T. T. Pizarro. 2004. Commentary: The role of the IL-18 system and other members of the IL-1R/TLR superfamily in innate mucosal immunity and the pathogenesis of inflammatory bowel disease: friend or foe?. Eur. J. Immunol. 34: 2347-2355. Tardieu, D., J. P. Jaeg, J. Cadet, E. Embvani, D. E. Corpet, C. Petit. 1998. Dextran sulfate enhances the level of an oxidative DNA damage biomarker, 8-oxo-7,8-dihydro-2′-deoxyguanosine, in rat colonic mucosa. Cancer Lett. 134: 1-5.
te Velde, A. A., F. de Kort, E. Sterrenburg, I. Pronk, F. J. Ten Kate, D. W. Hommes, S. J. van Deventer. 2007. Comparative analysis of colonic gene expression of three experimental colitis models mimicking inflammatory bowel disease. Inflamm. Bowel Dis. 13: 325-330. Maeda, S., H. Kamata, J. L. Luo, H. Leffert, M. Karin. 2005. IKKβ couples hepatocyte death to cytokine-driven compensatory proliferation that promotes chemical hepatocarcinogenesis. Cell 121: 977-990. Basseres, D. S., A. S. Baldwin. 2006. Nuclear factor-κB and inhibitor of κB kinase pathways in oncogenic initiation and progression. Oncogene 25: 6817-6830.